In May 1935, the Anchor Line went into liquidation, Anchor-Donaldson ceased to exist and the Cunard relationship ended. 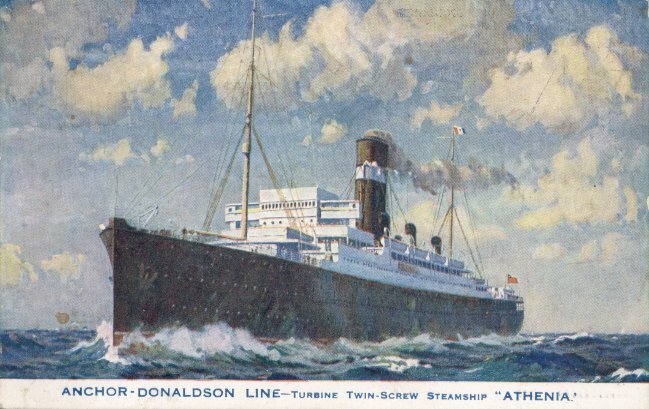 The Donaldson Line acquired Anchor's interest in Anchor-Donaldson, including Athenia, and changed its name to Donaldson Atlantic Line. The change in ownership had no effect on Athenia; she remained on the same Glasgow-Liverpool-Canada service as she had maintained for Anchor-Donaldson. On 3 September 1939, while en route to Montréal, Athenic became the first merchant marine casualty of World War II, when she was torpedoed and sunk by U30, some 200 miles west of the Hebrides. Unable to summon assistance when her radio room was damaged by shelling from the U-boat after it surfaced, Athenic developed a severe list which impeded the launching of all of her lifeboats. There were 112 fatalities out of the 1,418 on board, most occurring when three lifeboats were lost.